Two sites located between junctions, with no public access between them. A new site recently reopened by Euro Garages, with a completely different take on the former Little Chef which previously occupied the site. First two hours free for all vehicles, after which cars must pay £8 for 2-24 hours and HGVs must pay £14.99 or £19.99 to include a meal voucher for 2-24 hours. Prices can be paid in the Spar shop, with instructions in each car park. Also known as Raglan services, Monmouth services was built as one of Granada's first attempts to taste the market away from the motorway network. Their rivals Trusthouse Forte were building similar sites, including one up the road at Ross Spur. Although not a motorway, the A40 here was hooked up to the new M50 motorway in 1960, confirming this as the main route between The Midlands and South Wales. The forecourt was run by Fina, later Total. After Granada left the industry, the Little Chef it left behind struggled to maintain the building. The building started to look dilapidated, especially after the Burger King closed, leaving bare spaces on the signage. The Little Chef and Total filling station closed here on 24 September 2012, leaving only the Travelodge on the eastbound side. In summer 2013, that Travelodge closed, meaning that as of summer 2013, Monmouth services were left completely derelict. In September 2013, Euro Garages took over the services. 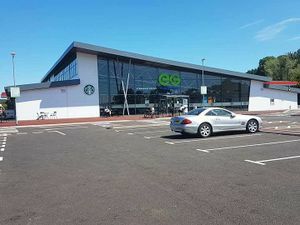 They held on to it until April 2015, when they demolished the old buildings and replaced them with a new building housing a Starbucks, Subway and Greggs, looking very similar to Rivington. The eastbound services opened on 16 March 2016 and the south-westbound building opened on 21 May 2016. The former Travelodge reopened in August 2017, having undergone refurbishment and with new 'Raglan Lodge' branding. A ‘Players Lounge’ games arcade initially opened within both amenity buildings however during early 2017, the westbound side lost its gambling licence and was temporarily closed. Both sides have now been re-branded as 'Jackpot Lounge'.